ANDREW of TUSCANY, an Irishman who, along with his sister St. Brigid (1st February), studied under St. Donatus (22nd October). St. Andrew accompanied St. Donatus to Italy, and when the later was appointed Bishop of Fiesole, he ordained St. Andrew to the deaconate. St. Andrew served as St. Donatus’ Archdeacon, restored the church of San Martino di Mensola and founded a monastery there. St. Andrew reposed shortly after St. Donatus, circa 880. ANTONINUS, a public executioner in Rome, who proclaimed himself a Christian after having a vision of angels. As a result of his conversion St. Antoninus was beheaded 186. ARNULF, (Eighth or Ninth Century), There is no reliable historical information on the life of St. Arnulf, and his existence may be entirely apocryphal. One legend states that he was a hermit near St. Neots, Cambridgeshire, England. Another possibility is that the existence of St. Arnulf is nothing more than a legend which grew up around a French tradition that the relics of St. Arnulf of Metz (18th July) were translated to England. ETHELGITHA, St. Ethelgitha was an abbess of a convent in Northumbria, England who reposed circa 720. Nothing further is known of her life. FABRICIAN and PHILIBERT, (Date Unknown), said to have been martyrs in Toledo, Spain, however, there is no information on their lives extent. GUNIFORT, (Date Unknown),a native of either Scotland or Ireland, St. Gunifort, his brother, and two of his sisters, left the British Isles, on a pilgrimage to Pavia. The sisters were martyred in Germany, his brother at Como, St. Gunifort, though injured, escaped Como, and reached Pavia, where he succumbed to his wounds. Though the exact year of his martyrdom is unknown, it has been conjectured it took place underduring the reign of Maximian Herculeus, which would place it circa 300. HIPPOLYTUS of PORTO, there are many contradictory versions of the life of St. Hippolytus. That which is most accepted is he was born in Arabia; a disciple of St. Irenaeus of Lyons (28th June), or more likely, Clement of Alexandria; that upon coming to Rome he was consecrated Bishop of Porto; and that he was martyred by drowning during the reign of Alexander Severus (222 – 235). MARTIAL, EPICTETUS, MAPRILIS, FELIX, and COMPANIONS, often referred to as the “Pilgrim Martyrs” they were a group of Christians on a pilgrimage to Rome, who were martyred at Porto near Rome, circa 300 either on the way to, on their return from, Rome. 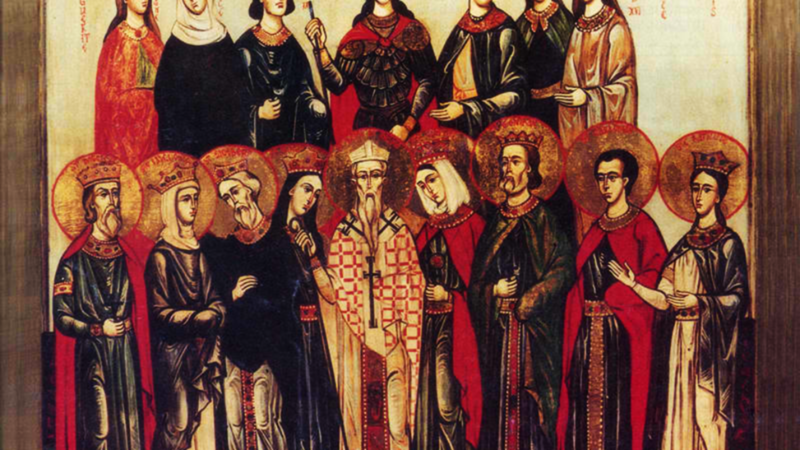 MAURUS and COMPANIONS, St. Maurus and a group of forty-nine of fellow Christians who were martyred for the faith at Rheims in north-eastern Gaul. Whilst traditionally their martyrdom has been said to have taken place during the reign of Emperor Valerian (r. 253 – 260), some contemporary scholars argue for dating it during the reign of Emperor Diocletian (r. 284 – 305). SIGFRID, a disciple of St. Benedict Biscop (12th January) at Wearmouth Abbey, St. Sigfrid succeeded St. Eosterwine (7th March) as Abbot of Wearmouth. St. Sigfrid reposed in 688, and in time, his relics were enshrined with those of SS. Benedict Biscop and Eosterwine in the Abbey church. SYMPHORIANUS, (Third Century), a Christian in Autun (present-day France), martyred for refusing to worship an idol. TIMOTHY, (Date Unknown), a martyr in Rome of whom little definitive is known. The general consensus is that after protracted imprisonment and brutal scourging, St. Timothy was beheaded, near where the Basilica of St. Paul's outside the Walls now stands.